CCTV footage of a man police want to trace in connection with the murder of a Lincolnshire man has been released. Alan Wood, 50, was found stabbed to death at his home in Lound on 24 October. Police said he had been subjected to a sustained attack. 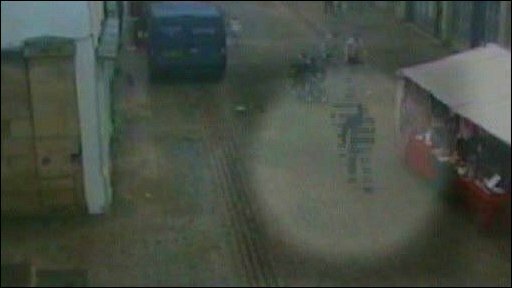 The CCTV images relate to footage from attempts to use Mr Wood's bank cards after his body was found. Money was withdrawn using the cards on October 22 and 23, possibly by the murderer, police said. Police have been examining CCTV footage from cash machines in Stamford and Bourne. The images are the result of extensive analysis of card transactions on Mr Wood's account and a trawl of many hours of footage, police said. 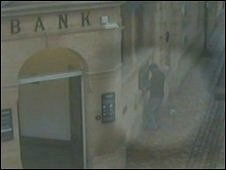 They show the possible suspect walking down High Street in Stamford on 24 October at 0915 GMT and the man then using a cash machine at NatWest in the town's High Street just seconds later. Det Supt Stuart Morrison said: "We want people to really study these images. "A family in our community has been devastated by the offender's actions. If you have any information, or any suspicions about anyone you know then please call us. "You may also have served this man in a shop, bar or café, again please contact us if you think you have."